One of the biggest knocks against any videocard these days is the loudness of the cooling solution. 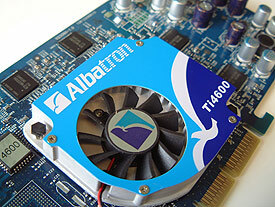 The Albatron Ti4600 uses a similar GPU cooler to other manufacturers (it's exactly the same mod, just not shiny) but produces less noise than that of the MSI G4Ti4600-VTD. Perhaps the metal cover helps keep vibration down? On a side note, that nice metal cover with the Albatron logo had very sharp edges and I cut my finger on it! If you'd like to learn a little more on GeForce4 technology, please read our GeForce4 Preview. Samsung BGA memory sans cooling? The memory on the Albatron GeForce4 Ti4600 is the same Samsung 2.8ns DRAM that's on every Ti4600. Clocked at 650 MHz, it's clocked 64 MHz lower then the memory allows. To find the maximum speed any memory modules is rated to run, you divide 1000 MHz by the ns rating. In our case 1000 is divided by 2.8ns however since it's also DDR module we will also have to multiply that number by 2 because DDR sends data on both the rising and falling edge of the clock cycle. The formula would be this 1000 MHz / 2.8 x 2 = 714 MHz and we see that the maximum rated speed for the Samsung BGA memory with a 2.8ns rating is 714 MHz. Because the memory is based on cooler running BGA form factor, Albatron didn't feel they needed to add RAMsinks to help keep the memory cool. From the evidence there is online, RAMsinks don't seem to cool any better or allow for a better overclock either. A nice trend that we have noticed in the last little while is that manufacturers are using thermal paste between GPU's and the heatsinks rather then thermal pads. Thermal paste offers greater heat transfer abilities then those yucky thermal pads. It seems however that Albatron was a little too eager when applying thermal paste on the test sample, it spilt over and landed on the PCB next to the core. Since they use silicon based compound this really won't hurt the card. As the GeForce4 Ti4600 core is based on the newer A3 stepping we were hoping for a good GPU overclock. Both our Gainward and MSI Ti4600's were based on the A2 stepping and they hit 328 MHz and 325 MHz respectively. The max we were able to get out of the Albatron Ti4600 was 330 MHz with stock cooling, anything higher and it would lock up randomly in 3D applications. Not great, but it's a new high for us. The memory was not going to be out done by the good GPU overclock and with no additional cooling was able to hit 760 MHz. Anything higher and Artifact Tester would start registering artifacts that were unnoticeable. The memory go up to 775 MHz before artifacts were visible in 3DMark and Q3.